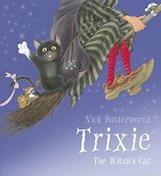 Trixie the cat tries everything she can to make her one white paw black to match the rest, but when she finally succeeds, she realises she has lost part of her identity. This book is full of beautiful, big illustrations that are perfect for sharing with groups of children, who will enjoy looking at the wonderful details in the pictures. In particular, the antics of two extra characters, a rat and a frog, who are not mentioned in the story but who appear on many pages, will enthral young readers. The delightful facial expressions and body language of Trixie will fill children with a range of emotions – anger, joy, revulsion, sadness and happiness. The book’s large, clear text and short, simple sentences make it ideal to read alone, or in small groups.